The Starbucks Replacement straws fit perfectly in your Starbucks Cold-To-Go Cup. Made from highly durable Acrylic plastic, they can and will withstand punishment. Hand wash only. Using the included nylon cleaning brush. The bottom ring prevents your straw from falling or being pulled out of the lid. 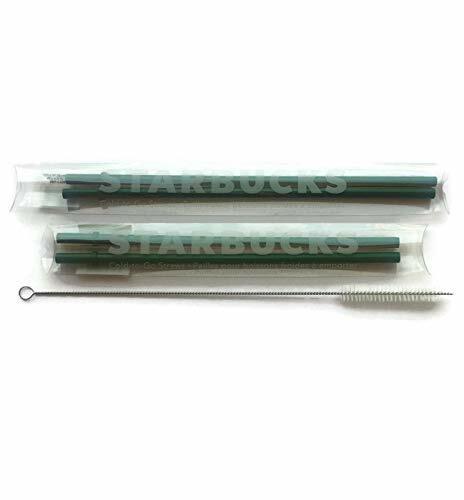 This pack of 2 Venti and 2 Grande reusable acrylic Cold Cup straws comes in Starbucks green BPA-Free and 1 extra long Stainless Steel Nylon Cleaning Brush. 12inch length ½ inch bristle by TPG~ Hand wash only. Do Not use for hot drinks. If you have any questions about this product by Starbucks custom, contact us by completing and submitting the form below. If you are looking for a specif part number, please include it with your message.